Cat-allergic young florist x Beautiful widow who owns a mischievous cat! A beautiful and gentle woman in a cute dress, living her peaceful life with her cat inside a big house--such picture perfect moment captivates the naive Tarou Inui in one second! 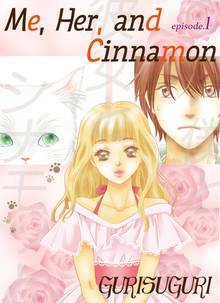 But, how can he win her heart, if Cinnamon the cat always disrupts his effort? Not to mention Tarou has a severe Cat allergy. "Me, Her, and Cinnamon" is short rom-com that will bring you into laughs and tears at the same time!